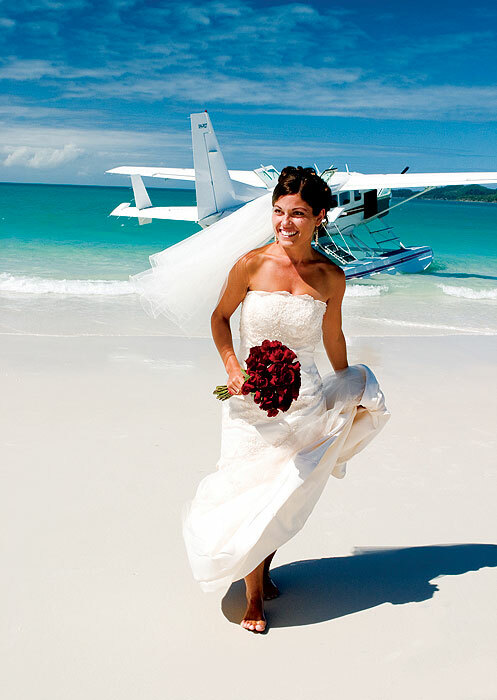 A bride alights from an Air Whitsundays plane on Whitehaven Beach; how's that for an entrance? 1 Plan to get married in The Whitsundays when it’s winter everywhere else. Between June and August, there’s an average daily temperature of 24°C and perfect clear blue skies. 2 Charter a yacht that the bride can sail in on, and the bride and groom can sail away on. 3 Or have the bride arrive by seaplane on Whitehaven Beach – it’s one of the 100 things Australian Traveller recommends you must do before you die, and what a way to tick it off the list! 4 Take a scenic flight over Heart Reef near Hardy Lagoon. Aw, it’s so romantic! 5 If your resort has villas with private plunge pools (ie at qualia or the Hayman Island Beach Villas), splash out for the extra intimacy. If you can’t afford it for your wedding night, when can you? 7 If you’re on an island, make sure your wedding-night accommodation is slightly separated from the other guests’ lodgings for that extra bit of privacy. There’d be nothing worse than getting saucy on your balcony only to look up and have your mum and dad waving at you from theirs! 8 Trust your planner. Whitsunday wedding planners know what’s available, what works and what doesn’t. Ask if they think there’s a way something can be done better, or more affordably. 9 Ask for a group discount if your entire wedding party is staying on the one island – you could have chosen a different location, after all! 10 Research all possible locations before you lock one in. There are 74 islands in The Whitsundays, including Hayman, Hamilton (the largest, with the most variety of accommodation), Daydream (great for families) and Hook (spectacular snorkelling). There are also some gorgeous coastal towns on the mainland, such as Laguna (great for golfers), Airlie Beach (the perfect kicking off point for day trips to the islands and Reef), Bowen (a quaint seaside town with sandy beaches and beautiful mountain backdrop) and Hydeaway Bay and Dingo Beach (perfect for nature lovers).